Ananda in the Himalayas is next to the town of Rishikesh, the birthplace of yoga. 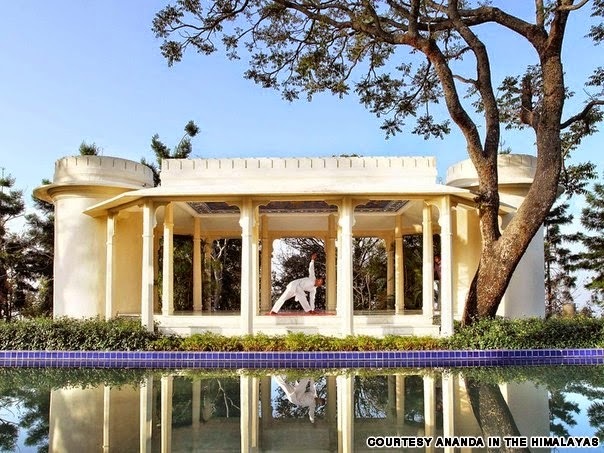 Daily yoga sessions and meditation classes are held in the outdoor Music Pavilion or Palace Ballroom. COMO Shambhala Estate is devoted to mind, body and spirit programs. You can take in Bali's rice paddies and river gorges with nature hikes, biking and rafting. Not all wellness centers have to be remote. Peppers Sentosa Seminyak is conveniently located on Seminyak beach amid boutiques, galleries, restaurants and bars. The Yoga Barn in Ubud is a rustic yoga studio, holistic healing retreat and boutique hotel. Classes include a range of yoga styles, meditation and ecstatic dance. With the tagline "Get more out of life," Thanyapura in Phuket, Thailand, was created to promote better living through sports and fitness. No cigarettes and no children at this serious health destination in Hua Hin, Thailand. Chiva-Som is popular with celebrities like the Beckham's, Kate Moss and Elizabeth Hurley. Kamalaya Wellness Sanctuary in Koh Samui, Thailand, offers a range of treatments, from detox and cleansing to yoga and emotional healing. Its facilities include a steam cavern and wellness center. What started as an Ashtanga yoga retreat has evolved into Samahita Wellness Retreat, a center that offers massages, detox, colonic and holistic wellness programs with three yoga studios. Sri Lanka's Barberyn Ayurvedic resorts offer customized treatments and wellness programs whether you're recovering from serious injuries or simply on a holiday. Recognized for its spa cuisine, The Farm at San Benito, Philippines, features one of Asia's first vegan restaurants, as well as raw food restaurant.